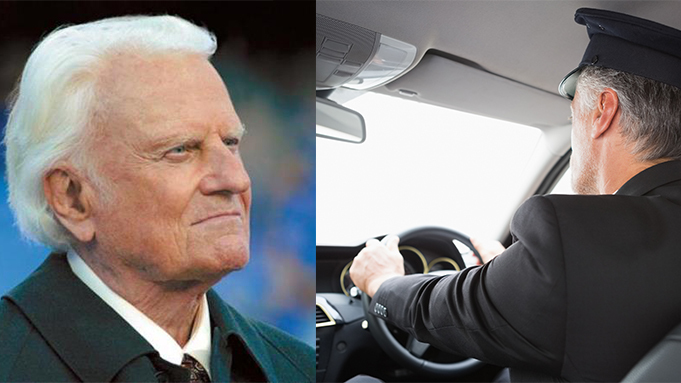 Billy Graham was returning to Charlotte after a speaking engagement and when his plane arrived, there was a limousine there to transport him to his home. Billy gets into the driver's seat and they head off down the highway. A short distance away sat a rookie state trooper operating his first speed trap. The long black limo went by him doing 70 in a 55 mph zone. The trooper pulled out and easily caught the limo and he got out of his patrol car to begin the procedure. The young trooper walked up to the driver's door and when the glass was rolled down, he was surprised to see who was driving.